Steam distillation is a terrific method of water treatment, particularly when you are dealing with real problem water. 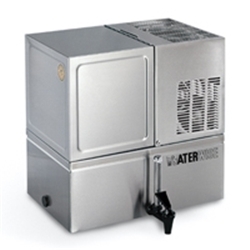 Use a distiller when your water is known to be bacteriologically unsafe or when the level of dissolved metal contamination is too high to reasonably use our MB Series filter. Distillers purify the water by boiling it, to produce steam. The steam is collected and cooled to return it to the liquid state. The contaminants remain in the boiling chamber while the purified water is collected in a separate reservoir. This method provides very high purity water but it does use electricity and it does take up to 4 hours to make a gallon of water. Custom Pure carries two models of steam distillers . 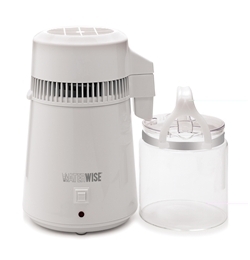 The Waterwise 4000 is our portable and more economical model. It consistently produces fresh, great tasting drinking and cooking water for you and your family at home, the office or while traveling. Automatic shutoff after one gallon cycle. Pre and post carbon filtration for complete VOC removal. Stainless Steel condenser and boiler. Glass one gallon bottle included. The Waterwise 7000 (aka Dol-Fyn Distiller System I), is a fully automatic distiller plumbed directly to your water supply. It produces up to 9 gallons (34 liters) of distilled water per day. The compact 3.75 gallon (14.2 liter) reservoir is especially well suited for small spaces. This distiller will even fit onto the average countertop. If you have real "problem" water and want water as pure as possible, this is a great choice. Fully automatic operation. This distiller does it all...automatically! Unique removable boiling chamber. Routine boiler cleaning is a snap. Easy installation. No drain system to hook up; installation is a breeze. Fully accessible reservoir. The reservoir (on any distiller) should be cleaned occasionally; our design makes this a simple process rather than an overwhelming chore. Shop online: Purchase the Waterwise 4000 or the Waterwise 7000 in the shopping cart. To return to this page, use your browser's Back button. Please contact us if you have any questions about our steam distillers and whether this is the right choice for you.